A basic understanding of React, Node.js and PWA are needed to follow this tutorial. Progressive Web Apps are experiences that combine the best of the web and the best of apps. They use service workers, HTTPS, a manifest file and an app shell architecture to deliver native app experiences to web applications. 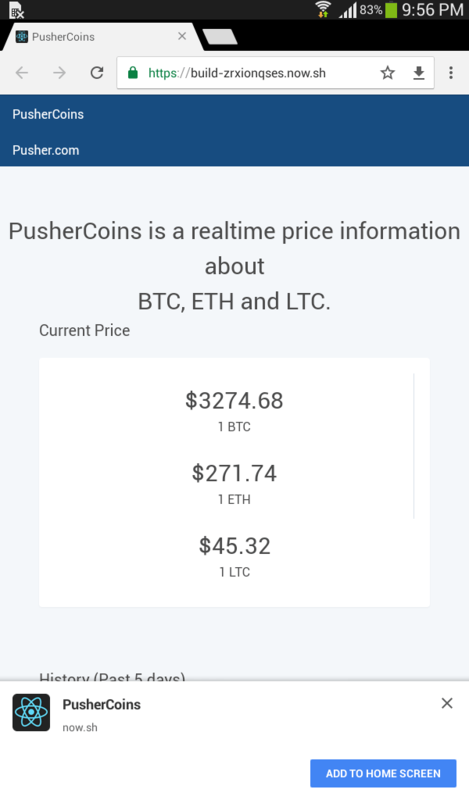 In this tutorial, we’ll build a PWA called PusherCoins. 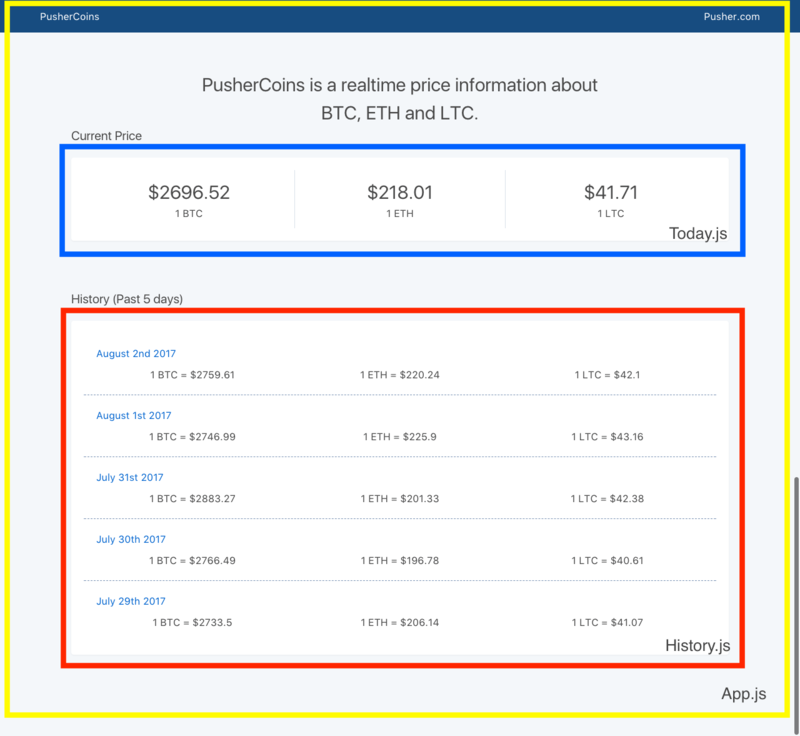 PusherCoins shows the current and past price information about BTC, LTC, and ETH using data from Cryptocurrency. A demo can be seen below. The current Bitcoin, Ether, and Litecoin price will be updated every 10 seconds and the change will be realtime and seen across other connected clients connected via Pusher. We’re going to be building a realtime PWA with the help of create-react-app. Some of the common comments made by developers who are just getting into React are that it is hard to set up and there are so many ways to do things. create-react-app eliminates all of that by allowing developers to build React apps with little or no build configuration. All you have to do to get a working React app is install the npm module and run a single command. Most importantly, the production build of create-react-app is a fully functional Progressive Web Application. This is done with the help of the [sw-precache-webpack-plugin](https://github.com/goldhand/sw-precache-webpack-plugin) which is integrated into the production configuration. 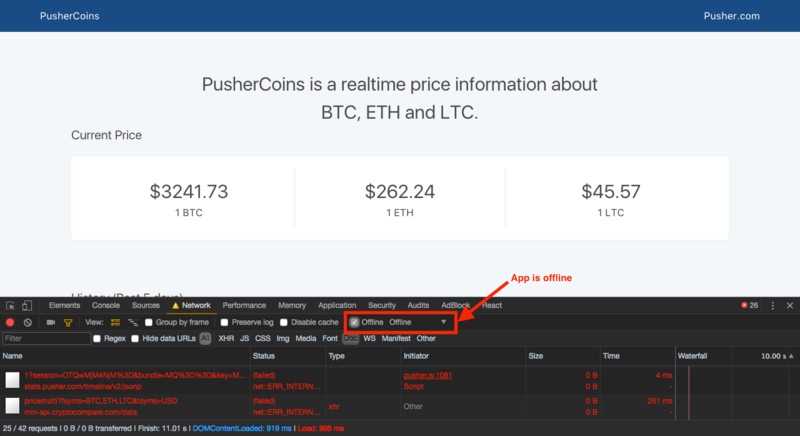 Once the installation process has been completed, you can now create a new React app by using the command create-react-app pushercoins. This generates a new folder with all the files required to run the React app and a service worker file. A manifest file is also created inside the public folder. The manifest.json file in the public folder is a simple JSON file that gives you, the ability to control how your app appears to the user and define its appearance at launch. We notify the app of the manifest.json file by linking to it in line 12 of the index.html file. Next up, let’s go through the registerServiceWorker.js file and see how the service worker file works. The service worker file can be seen in the src folder on on GitHub. The service worker code basically registers a service worker for the React app. We first check if the app is being served from localhost via the isLocalhost const value that will either return a truthy or falsy value. The register() function helps to register the service worker to the React app only if its in a production mode and if the browser supports Service workers. The unregister() function helps to unregister the service worker. Let’s find out if the service worker really works. To do that we’ll need to prepare the React app for production as the Service Worker code only works in production mode. The npm run build command helps with that. 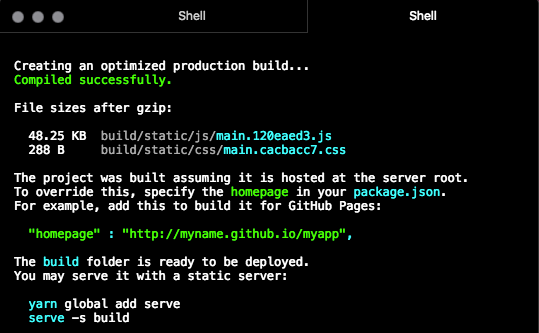 This command builds the app for production to the build folder and correctly bundles React in production mode and optimizes the build for the best performance. It also registers the service worker. Run the command and the output from the terminal should look like something below. We get to see the size of the files in our React app and most importantly how to run the app with the aid of a static server. We are going to use serve npm package to, wait for it, serve(😀) the React app. Therefore, use the following commands to install serve on your computer and also setup a static server for the app. Your application should be up and running at http://localhost:5000. So how do we check if a site is a PWA? We can do that by checking the service worker section in the Application tab in the Developer tools. We could also check by using the Lighthouse tool. Lighthouse is an open-source, automated tool for improving the quality of web pages. 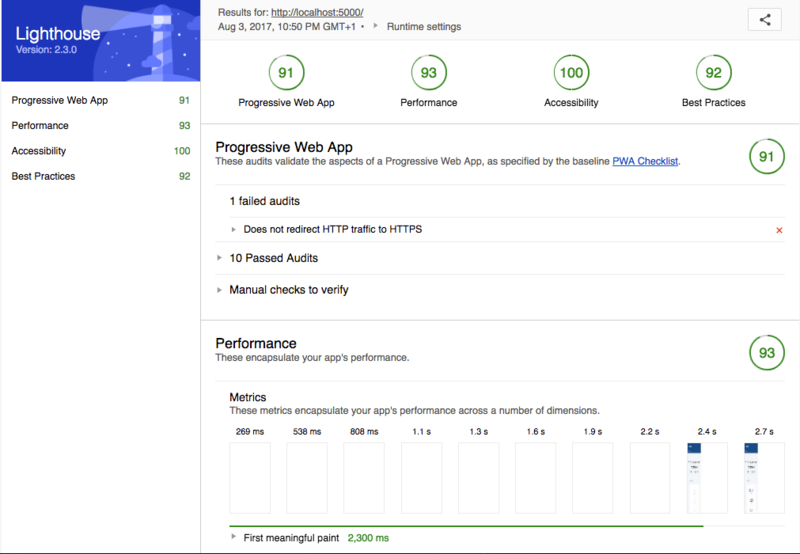 It has audits for performance, accessibility and progressive web apps. Lighthouse is currently available as an extension on Google Chrome only and as an npm package. I used the Lighthouse extension to generate a report for the newly created React app in production and got the following result. 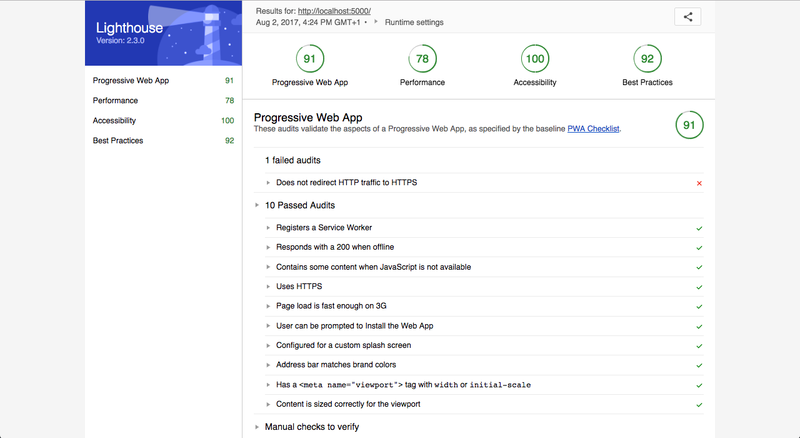 The React app got a score of 91 out of 100 for the PWA section, which isn’t that bad. All audits were passed bar the one about HTTPS, which cannot be implemented right now because the app is still on a local environment. Now that we know how to check if an app is a PWA, let’s go ahead to build the actual app. As we’ll be building this PWA with React, it’s very important that we think in terms of React components. Therefore, the React app would be divided into three components. History.js houses all the code needed to show the past prices of BTC, ETH, and LTC. Today.js houses all the code needed to show the current price of BTC, ETH and LTC. Alright, let’s continue with building the app. We’ll need to create two folders inside the src folder, Today and History. In the newly created folders, create the files Today.js, Today.css and History.js, History.css respectively. Your project directory should look like the one below. Before we get started on the Today and History components, let’s build out the app shell. We’ll also be using the Bulma CSS framework, so add the line of code below to your index.html in public folder. Next up, open up the Today.js file as we’ll soon be writing the code for that component. So what does this component do? It’s responsible for getting the current prices of Bitcoin, Ether and Litecoin from the Cryptocurrency API and displaying it on the frontend. Let’s write the code. The next thing to do is create an ES6 class named Today that extends the component module from react. // This is called when an instance of a component is being created and inserted into the DOM. // We set the latest prices in the state to the prices gotten from Cryptocurrency. // The render method contains the JSX code which will be compiled to HTML. In the code block above, we imported the react and component class from react. We also imported axios which will be used for API requests. In the componentWillMount function, we send an API request to get the current cryptocurrency rate from Cryptocurrency. The response from the API is what will be used to set the value of the state. Let’s not forget the CSS for the component. Open up Today.css and type in the following CSS code. The next step, is to write the code for History.js. This component is responsible for showing us the prices of BTC, ETH and LTC from the past five days. We’ll be using the axios package as well as the moment package for formatting dates. Moment.js can be installed by running npm install moment in your terminal. Open up the History.js file, the first thing we do is import React and its Component module using ES6 import, we also import axios and Moment.js. Like we did in the Today.js component, we’ll create an ES6 class named History that extends the component module from react and also create some functions which will be bound with this. As seen in the code block above, we have defined state values that will hold the price information about BTC, ETH, and LTC for the past five days. We also created functions that returns API requests to Cryptocurrency. Now, let’s write the code that utilizes the functions above and stores the various prices in the state and renders them. Okay, so let’s continue with the rest of the code and write out the functions that gets the values for the past 5 days. // This function gets the prices for the current date. // axios.all is used to make concurrent API requests. These requests were the functions we first created and they accept an argument of the date required. // This function gets the prices for the yesterday. // This function gets the prices for the two days ago. // This function gets the prices for the three days ago. // This function gets the prices for the four days ago. So we have five functions above, they basically just use moment.js to get the date required and then pass that date into the functions we first created above, to get the price information from Cryptocurrency. We use axios.all and axios.spread which is a way of of dealing with concurrent requests with callbacks. The functions will be run in the componentWillMount function. Finally, for History.js, we’ll write the render function. We can now run the npm start command to see the app at http://localhost:3000. We can quickly check to see how the current state of this app would fare as a PWA. Remember we have a service worker file which currently caches all the resources needed for this application. So you can run the npm run build command to put the app in production mode, and check its PWA status with Lighthouse. We got a 91/100 score. Whoop! The only audit that failed to pass is the HTTPS audit which cannot be implemented right now because the app is still on a local server. Our application is looking good and fast apparently (Interactive at < 3s), let’s add realtime functionalities by adding Pusher. 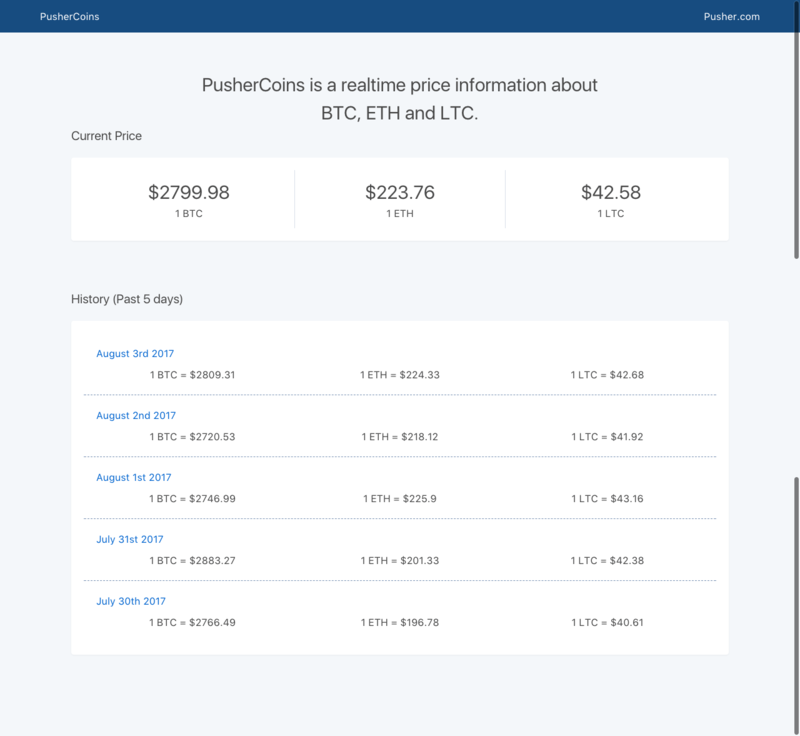 By using Pusher, we can easily add realtime functionalities to the app. Pusher makes it simple to bind UI interactions to events that are triggered from any client or server. Let’s setup Pusher. Log into your dashboard (or create a new account if you’re a new user) and create a new app. Copy your app_id, key, secret and cluster and store them somewhere as we’ll be needing them later. This is a simple Node.js server that uses Express as its web framework. Pusher is initialized with the dashboard credentials, and the various API routes are also defined. Don’t forget to install the packages in use. We’ll also need to add a line of code to the package.json file so as to allow API proxying. Since we will be running a backend server, we need to find a way to run the React app and backend server together. API proxying helps with that. To tell the development server to proxy any unknown requests (/prices/new) to your API server in development, add a proxy field to your package.json immediately after the scripts object. The first thing to do is import the pusher-js package. In the componentWillMount method, we establish a connection to Pusher using the credentials obtained from the dashboard earlier. We need a way to query the API every 10 seconds so as to get the latest price information. We can use the setInterval function to send an API request every 10 seconds and then send the result of that API request to Pusher so that it can be broadcasted to other clients. Before we create the setInterval function, let’s create a simple function that takes in an argument and sends it to the backend server API. Let’s create the setInterval function. We will need to create a componentDidMount method so we can put the interval code in it. So right now, the app queries the API every 10 seconds and sends the data to Pusher, but we still haven’t made the app realtime. We need to implement the realtime functionality so that other clients/users connected to the application can see price change in realtime. That will be done by using Pusher’s bind method. Inside the componentDidMount method, add the code below, immediately after the setInterval function. The code block above, listens for data from Pusher, since we already subscribed to that channel and uses the data it gets to update the state values, thus, realtime changes. We now have Progressive Realtime App! See a demo below. Right now, if we were to go offline, our application would not be able to make API requests to get the various prices. So how do we make sure that we still able to see some data even when the network fails? One way to go about it would be to use Client Side Storage. So how would this work? We’ll simply use localStorage to cache data. It’s important to note that there are other types of client side storage, such as Session Storage, Cookies, IndexedDB, and WebSQL. Local Storage can be used for a demo app like this, but in a production app, it’s advisable to use a solution like IndexedDB which offers more features like better structure, multiple tables and databases, and more storage. The goal will be to display the prices from localStorage. That means we’ll have to save the results from various API requests into the localStorage and set the state to the values in the localStorage. This will ensure that when the network is unavailable and API requests are failing, we would still be able to see some data, albeit cached data. Let’s do just that. Open up the Today.js file and edit the code inside the callback function of the API request to get prices with the one below. We are essentially storing the values gotten from the API request to the localStorage. With our values now in the localStorage, we’ll need to set the state values to the saved values in localStorage. Inside the componentDidMount method, before the setInterval code, add the following code. The code above is only executed when the browser is offline. We can check for internet connectivity by using navigator.onLine. The navigator.onLine property returns the online status of the browser. The property returns a boolean value, with true meaning online and false meaning offline. Let’s now implement localStorage for History.js too. We’ll need to save the values gotten from the API in these functions ( getTodayPrice(), getYesterdayPrice(), getTwoDaysPrice(), getThreeDaysPrice(), this.getFourDaysPrice() ) to the localStorage. We are essentially storing the values gotten from the API request to the localStorage. With our values now in the localStorage, we’ll also need to set the state values to the saved values in localStorage like we did in the Today component. Create a componentDidMount method and add the following code inside the method. Now our application will display cached values when there’s no internet connectivity. It’s important to note that the app is time sensitive. Time sensitive data are not really useful to users when cached. What we can do is, add a status indicator warning the user when they are offline, that the data being shown might be stale and an internet connection is needed to show the latest data. This builds the app for production to the build folder. Alright, so the the next thing to do is to create a server in which the app will be served from. Inside the build folder, create a file named server.js and type in the following code. This is basically the same code we wrote in the server.js file in the root of the project directory. The only addition here is that we set the home route to serve the index.html file in the public folder. Next up, run the command npm init to create a package.json file for us and lastly install the packages needed with the command below. Deploying to Now is very easy, all you have to do is run the command now deploy and Now takes care of everything, with a live URL automatically generated. If everything goes well, your app should be deployed and live now, in this case, https://build-zrxionqses.now.sh/. Now automatically provisions all deployments with SSL, so we can finally generate the Lighthouse report again to check the PWA status. A live Lighthouse report of the site can be seen here. 100/100! Whoop! 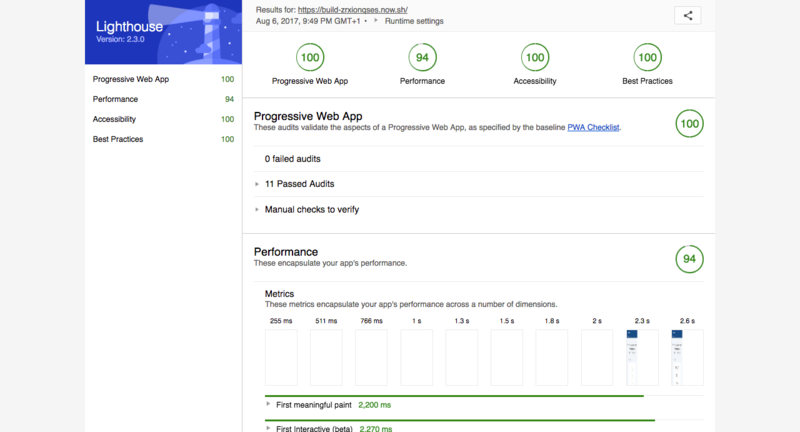 All the PWA audits were passed and we got the site to load under 5s (2.6s). Has a service worker registered on your site. Is served over HTTPS (a requirement for using service worker). Is visited at least twice, with at least five minutes between visits. The manifest.json file in the public folder meets all the requirements above, we have a service worker registered on the site and the app is served over HTTPS at https://build-zrxionqses.now.sh/. In this tutorial, we’ve seen how to use ReactJS, Pusher and Service Workers to build a realtime PWA. We saw how service workers can be used to cache assets and resources so as to reduce the load time and also make sure that the app works even when offline. We also saw how to use localStorage to save data locally for cases when the browser looses connectivity to the internet. The app can be viewed live here and you can check out the Github repo here. See if you can change stuff and perhaps make the app load faster!